Back in 2001, I worked as a writer for a travel company and was returning from a two-week cruise around Japan. As fate would have it, the date was September 11th. Our plane was diverted from L.A. to Vancouver that morning following the attacks, and I spent a week wandering the city. Escaping the horrifying news on TV, I visited a local record store and saw a flyer about a Belle and Sebastian concert that night. It felt a little odd to buy a ticket given the awful circumstances, but the opportunity was too great to skip. I wasn’t a huge fan at the time but knew their music pretty well from a few albums. It was a wise decision. The show at the gorgeous Orpheum Theatre remains one of my favorite all-time concerts. The setting was the perfect spot for Belle and Sebastian’s sound, and the beautiful melodies delivered a magic evening that I’ll never forget. I mention this experience up front to explain my obvious bias towards Stuart Murdoch and his band. It’s impossible to separate my feelings about God Help the Girl from my love of Belle and Sebastian. Murdoch’s debut film creates a very similar sensation to experiencing the best parts of his music. It fits a particular taste and may send plenty scurrying for the exits, but I’m not one of those people. Emily Browning (Sleeping Beauty) stars as Eve, a young singer living in a psychiatric hospital. When she escapes and goes to Glasgow, she meets James (Olly Alexander) and moves into an unused bedroom in his flat. James is a singer and guitarist, so they’re kindred spirits. You could label them as hipsters, but that undervalues their talents. Eve has an incredible voice, and James' music style fits with her skills. They connect with his guitar student Cassie (Hannah Murray) and become fast friends. The next step is forming a band, and the trio quickly becomes a large ensemble. What a vibrant film this is! I was hooked from the moment that Eve climbed out her window and belted out the first notes of “Act of the Apostle”. While the opening credits roll, she boards a train and even does an impromptu dance at the station. The songs function more like music videos than your typical movie musical. There's a definite Whit Stillman vibe to the setting, particularly when compared to Damsels in Distress. The characters perform for the camera more than each other, and everything in the frame conveys that glow. When James, Eve, and Cassie sing together for the first time with "If I Could Speak", their choreography is like a well-rehearsed performance. Despite the theatricality, it feels natural because the actors sell it. The clothes and set design are so colorful that it doesn’t feel out of place once the singing begins. When a old-school dance party happens during the joyous “I’ll Have to Dance with Cassie”, it works despite the shift from reality. Murdoch conveys such joy for the music that it’s easy to get swept up in the excitement. It’s like a Belle and Sebastian show from the early 2000s broke out inside the movie. 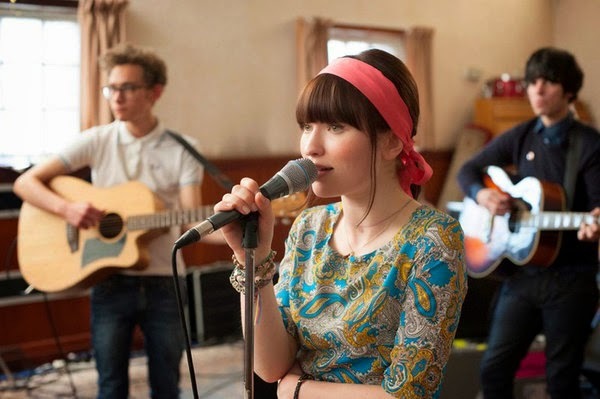 Emily Browning's Eve leads the band in Stuart Murdoch's debut film God Help the Girl. There are definite connections between this story and Murdoch’s life, particularly when you consider the origins of Belle and Sebastian. He wrote their early songs while facing a serious illness and built a large group that sounds a lot like the film’s band. Even so, it’s too easy to just connect each moment with Murdoch’s past. It’s a personal project inspired by his life, but it’s a lot more than a thinly veiled retelling. There’s plenty to enjoy within this story apart from its ties to Murdoch. Watching Eve succumb to depression is difficult and such a contrast from the exuberant music. Her well-being hangs by a string, and the songs are an outlet to keep her afloat. Eve’s a force of nature in her best moments, but that excitement masks a real melancholy that could return quickly. A Kickstarter campaign helped to finance God Help the Girl, and it feels like a love letter to fans. A joy to creating art permeates the film. Dramatic conflicts arise, but what sticks is the idea that we can do amazing things. When the right people connect, there’s no limit to what they can produce. This hyper reality is cute and precious, yet that’s hardly a bad thing. There’s plenty of dreariness in real life, so escaping through beautiful music is just the right remedy. On that note, a subplot with the self-absorbed rocker Anton (Pierre Boulanger) feels like a misstep because it doesn’t share the same mix. He generates romantic troubles, yet it’s clear from the start that he’s hardly worth Eve’s time. When your main personality traits are a haircut and a smile, it is not a good sign. I’d only seen Browning in a few previous roles, so I had no idea about her singing talents. Her voice is magnetic and far removed from common standards of skill from conventional pop music. Hannah Murray's style is so different, and their voices have such great chemistry. When the band takes the stage for their showcase performance to play "Down and Dusky Blonde", we can believe the crowd’s thrilled reactions. The moment feels earned and culminates the ups and downs for Eve and the group. There’s a great callback to A Hard Day’s Night with the prospective members chasing James through the streets. It’s like everyone's been waiting to join this band, and they’re fulfilling a gap in the music world. Their initial goals of adding drums and a bass player are expanded into a much larger ensemble. How could they let down such excited musicians? What makes God Help the Girl click is the genuine friendship behind the glowing music videos. James has feelings for Eve, but the love story never dominates. They’re friends that enjoy hanging out together, and the emotional bond is there without the romance. A canoeing trip by the trio is just a fun adventure for young souls enjoying each other’s company. Murdoch excels at showing the performances, but he gives the characters time to connect. There’s a lightness that shouldn’t be confused with a lack of substance. It’s the type of summer that will probably never happen again. They’re becoming adults and will have to decide where their lives are headed. James can’t work as a lifeguard forever. His idealistic view of pop songs is endearing, but it’s just a piece of the puzzle. Eve recognizes that the band is amazing but isn’t enough to prevent her demise. It’s a difficult choice with possible flaws, yet her move is understandable. They’ve created something magical, but even the best intentions have their limits. It’s a telling reminder that Eve can’t avoid her demons, even when so much enjoyment comes from their music. You just sold this movie to me. I am not a fan of Belle and Sebastian, but their music is different. I have to watch this when I can. Great review! Andina, I think it's worth checking out. It's possible it won't work for you, but there's enough life on screen (if you're okay with musicals) to make it work. If you get a chance to take a look, let me know what you think! I had not even heard of this film until your review. I will have to add this to the list of films to track down. Though I am not the biggest Belle and Sebastian fan, saw them in concert with The New Pornographers a few years back, I am always interested to see how artists from various backgrounds tackle the world of cinema. Courtney, I will admit that I'm not as enamored with Belle and Sebastian's more recent work. They do have a new album coming out in January, so we'll see. I really enjoyed this movie, though I recognize that it's not going to be for all tastes. I'd be interested to hear your thoughts if you end up seeing it.